53 years young Vishakha is the dynamic Yuva Acharya of Siddha Samadhi Yoga (SSY) and president of the Life Yessence Academy (LiYA) USA. Born in an atheist but socially committed family Vishakha did not have any spiritual training in her formative years. Her introduction to spiritual path started at the age of 31 with Siddha Samadhi Yoga (SSY) program. It changed her life completely. In 1997, Vishakha was formally blessed by her Guru and founder, of Siddha Samadhi Yoga (SSY) programs – Yoga Brahmarshi Rishi Prabhakarji. Since then she has been enjoying the SSY life along with her husband and 2 daughters. Being an Apparel Technologist with specialization in International Business, Vishakha spent 20 years in Apparel Industry in India and later in US. She continued her learning and practicing the SSY lifestyle even after moving to the US along with her family in 2003. On taking responsibility of running the SSY center in the US, she resigned from a well paying comfortable job as Shipment Manager from one of America’s top Swimwear manufacturing companies. 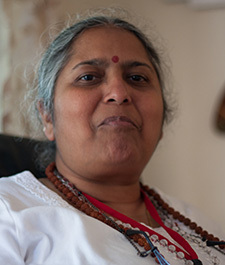 Since 2006 she has been serving her Guru in spreading the knowledge of Joyous Living through various SSY programs.